The folks at The Old Schoolhouse Magazine have put forth a new venture: SchoolhouseTeachers.com. 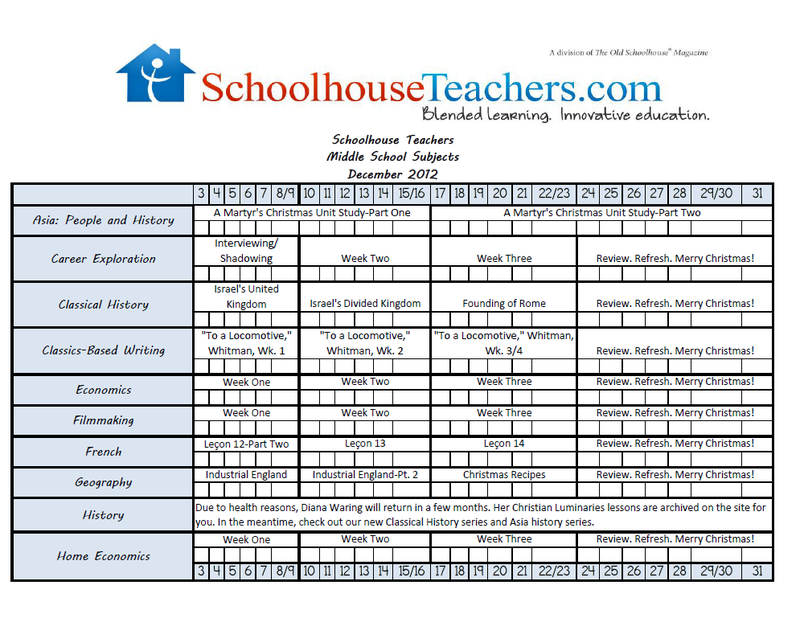 I've been exploring the site, and whether you are a seasoned homeschooler looking to fill some gaps in your current curriculum, or a new homeschooler wondering where to begin, you will find great information and resources at SchoolhouseTeachers.com! The goal is to have everything you need to homeschool your children, from kindergarten through graduation, in one place, at a price you can afford. The teachers are experts in their field, and many are names I recognized: Michelle Miller, Terri Johnson, and Diana Waring, just to name a few. SchoolhouseTeachers.com aims to be a versatile resource, and you can use it not only from your desktop or laptop, but from your mobile device as well. I could, conceivably, run my entire school day using my iPad. If you want printable lesson plans, each lesson is set up to download as a PDF file. (Well, not the videos. That would be tricky.) You can do whatever works best for you - paper you can hold in your hand, or electronic format. The site debuted back in March 2012, and has already grown significantly. There are 24 subject areas, including everything from core subjects like grammar, math and science, to great opportunities like film making and college choice guidance. In addition to teaching materials, they offer plenty of extras for the teacher, too, like access to ALL FIVE Schoolhouse Planners. The Schoolhouse Planner for the teacher is normally $39.95, and the student planners vary in price. That alone is a great value for the price of your membership! One thing I *loved* at first sight was the Monthly Reading List by Michelle Miller. Michelle is the author of Truthquest History, and has a private lending library of living books in Michigan. I am delighted to have access to her monthly recommendations, both for library visits and as possible books to add to our home library. She gives books for all ages, and I can see all of my children enjoying the books, whether I was reading to them, or my big girls were reading to my little boy. Another feature that I would find immensely helpful is the daily checklist. In my never-ending struggle to become more organized, I find checklists to be so useful. Because of the volume of information on the site, I can see that having the checklist handy would be the ticket to keeping me on track and remembering to do each thing I wanted to cover with my children. One feature I'd like to point out is the Special Needs section. There are lessons available for parents with a struggling/special needs student, to help you learn how to work with them at their level, choosing the right curriculum, etc. I know many families with at least one special needs child. If I were figuring out some issues with one of my students, this would be a huge help, I would think. In our Charlotte Mason homeschool, there would have to be some tweaking for us to use this as our primary curriculum. I could use the history section, for example, but I would use the timeline and find living books for us to read and discuss. There are some great activities that go along with the history studies that I would certainly pull in. The copywork, as given, is great for handwriting practice, but I would want to pull it from our readings. I would be the "seasoned homeschooler" that doesn't need a full curriculum, but could find lots to use. It's impossible for me to completely describe this website in a brief review. I hope take a look for yourself. The cost for membership is $1 for the first month, and $5.95 for each month after that. Right now, they're running a special promotion, which includes a 1-year membership for only $49, AND you also will receive the Old Schoolhouse 2013 Annual Print Book and a TOS tote bag. I love tote bags. Do you love tote bags? Can you ever have enough tote bags? Oh dear, I may be wandering a bit off the point. There are some other nice bonus gifts that you would receive with your membership, too. Head on over and check it out! Disclaimer: I received a free membership to SchoolhouseTeachers.com in exchange for my honest review. I was not required to write a positive review, nor was I compensated in any other way. All opinions I have expressed are my own. I am disclosing this in accordance with FTC regulations. just popping by from the TOS review crew. Seeing what you did with your review. :) You gave me a good idea on how to tweak mine a bit, so thanks.